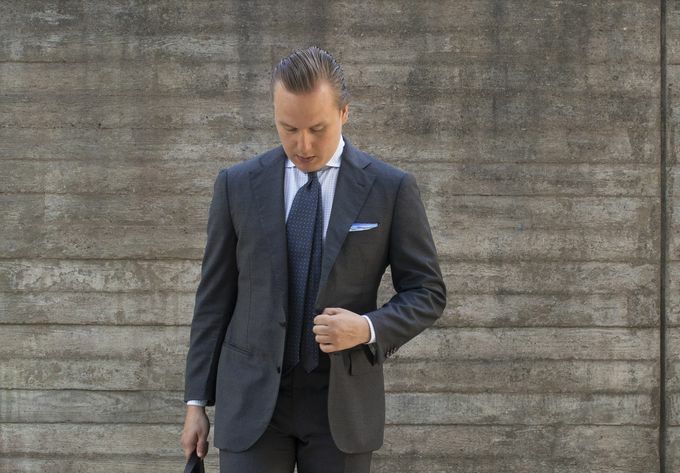 For many grey is their go to color when it comes to business outfits. Even though I personally slightly dislike using grey, it is infact a good choice when you want to look credible and let your professional skillsets do the talking. Furthermore, wearing grey doesn't change the core principals of timeless and elegant style - it's not the colors that make you primarily stylish, it is the fit and how you carry yourself. That said, I personally feel most shades of grey are quite dead colors compared to blues and browns. Greys don't combine as well with other colors and at the end of the day, you simply look a little bit more fresh and sharp wearing dark blue, for example. 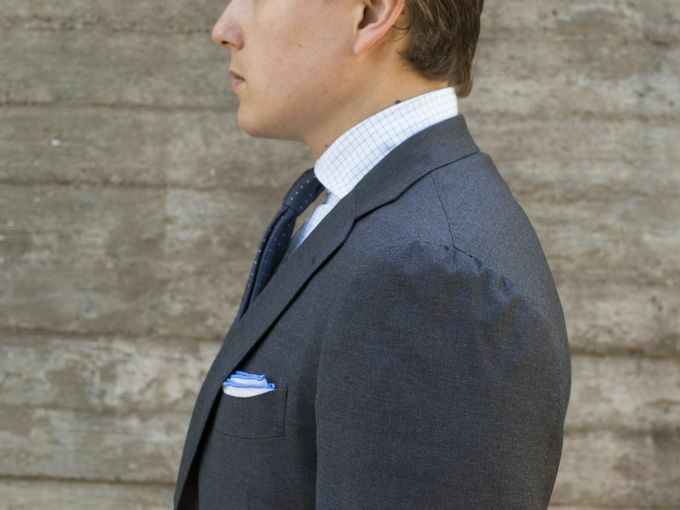 I myself only own one grey piece of clothing, which is the SuitSupply La Spalla suit seen in these pictures. This spring and early summer, I did some experimenting, trying to find some grey suit combinations I would really like. After a few tries, my favorite ended up being this particular look that is basically a monotone grey business outfit with small spalshes of sky blue and well-olished dark brown calf shoes from Vass. 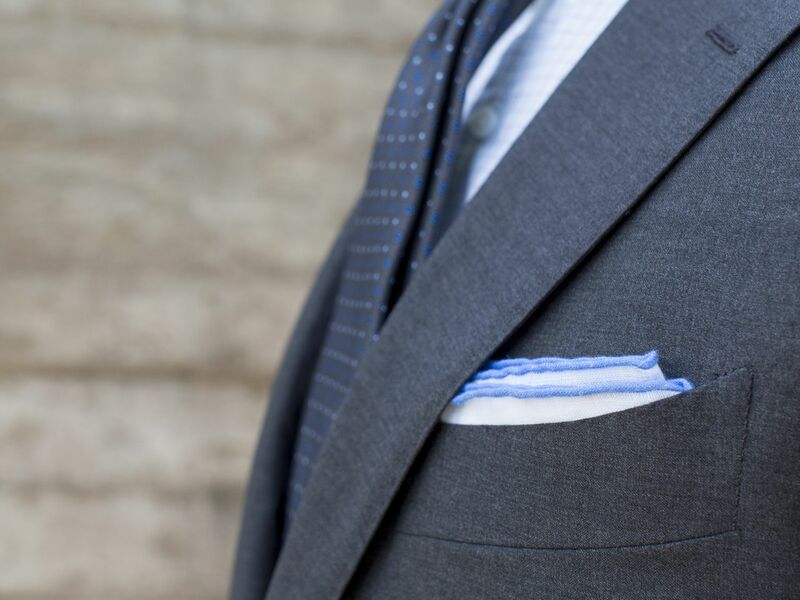 And in a way I think this look encaptures how the most common shades of grey are best used: as a color that basically highlights the fit and smaller handcrafted details of your suit, instead of creating an interesting color palette. And despite its shortcomings, this La Spalla does deliver in its classic cut, Neapolitan shoulders and quite beautiful stitching. So, the suit is from SuitSupply's La Spalla line and from wool/cashmere S150 fabric, tie from Viola Milano, linen contrast border pocket square from Shibumi Berlin, checked shirt from Luxire, braces from Viola Milano, socks from Drake's London, bag from Mismo and Oxfords from Vass. A white shirt is usually what you will want to wear with your grey suit, but here I've opted for a light blue micro check to add a little bit of texture to the overall look. The small touches of blue in the tie's floral print, pocket square's edge and the shirt give the outfit some freshness without popping out too much. The Neapolitan shoulder simply oozes life and is let to shine in the subdued entire look. 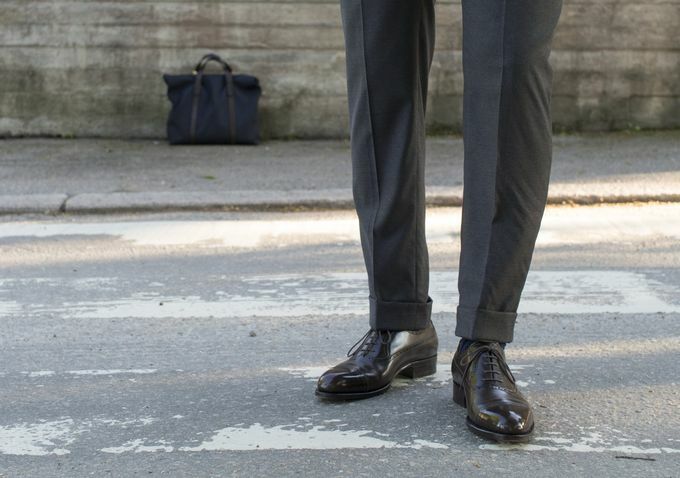 My made-to-order Vass Oxfords looking quite awesome here. The F-last and the dark brown shade are perfect for a formal business occasions, letting the craftmanship and superbly refined design shine instead of flashy colors.